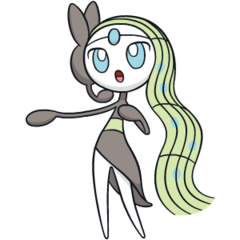 Meloetta does not evolve/is not evolved into. X The melodies sung by Meloetta have the power to make Pokémon that hear them happy or sad. X Es besitzt die Macht, Pokémon, die sich in seiner Nähe aufhalten, mit seinen Melodien froh oder traurig zu stimmen. X Les mélodies enivrantes de Meloetta touchent les Pokémon, pouvant les rendre heureux ou tristes. X Las melodías que canta Meloetta tienen el poder de hacer sentir felicidad a los Pokémon que hay a su alrededor. X Canta una melodia che ha il potere di portare la gioia o la tristezza nel cuore dei Pokémon che l’ascoltano. X 메로엣타가 연주하는 선율에는 주위 포켓몬을 기쁘게 하거나 슬프게 할 정도의 힘이 있다. Y Its melodies are sung with a special vocalization method that can control the feelings of those who hear it. Y Wer die Melodie hört, die es in einer speziellen Stimmlage von sich gibt, steht voll in seinem Bann. Y Sa voix si particulière lui permet de chanter des mélodies qui ensorcellent les gens et modifient leurs émotions. Y Controla los sentimientos de los que escuchan las melodías que emite con su singular vocalización. Y Controlla a suo piacimento le emozioni di coloro che ascoltano i suoi singolari vocalizzi. Y 특수한 발성법으로 노래하는 멜로디는 노래를 들은 자의 감정을 자유자재로 조종한다. Omega Ruby Its melodies are sung with a special vocalization method that can control the feelings of those who hear it. Omega Ruby Wer die Melodie hört, die es in einer speziellen Stimmlage von sich gibt, steht voll in seinem Bann. Omega Ruby Sa voix si particulière lui permet de chanter des mélodies qui ensorcellent les gens et modifient leurs émotions. Omega Ruby Controla los sentimientos de los que escuchan las melodías que emite con su singular vocalización. Omega Ruby Controlla a suo piacimento le emozioni di coloro che ascoltano i suoi singolari vocalizzi. Omega Ruby 특수한 발성법으로 노래하는 멜로디는 노래를 들은 자의 감정을 자유자재로 조종한다. 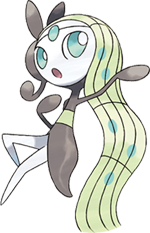 Alpha Sapphire The melodies sung by Meloetta have the power to make Pokémon that hear them happy or sad. Alpha Sapphire Es besitzt die Macht, Pokémon, die sich in seiner Nähe aufhalten, mit seinen Melodien froh oder traurig zu stimmen. Alpha Sapphire Les mélodies enivrantes de Meloetta touchent les Pokémon, pouvant les rendre heureux ou tristes. Alpha Sapphire Las melodías que canta Meloetta tienen el poder de hacer sentir felicidad a los Pokémon que hay a su alrededor. Alpha Sapphire Canta una melodia che ha il potere di portare la gioia o la tristezza nel cuore dei Pokémon che l’ascoltano. Alpha Sapphire 메로엣타가 연주하는 선율에는 주위 포켓몬을 기쁘게 하거나 슬프게 할 정도의 힘이 있다. Black Its melodies are sung with a special vocalization method that can control the feelings of those who hear it. White Many famous songs have been inspired by the melodies that Meloetta plays. Black 2 The melodies sung by Meloetta have the power to make Pokémon that hear them happy or sad. White 2 The melodies sung by Meloetta have the power to make Pokémon that hear them happy or sad.